In this video, we will discuss, how to select a master page dynamically at runtime. Let us understand this with an example. This is what we want to achieve. 1. We have 2 master pages in our application. 2. Include a dropdownlist on both the master pages. The dropdownlist should display both the master pages. 3. As we select a master page from the dropdownlist, we want the selected master page to be dynamically set as the master page. 1. Create a new asp.net webforms application and name it WebFormsDemo. 2. Add a class file to the project and name it BaseMaterPage.cs. Copy and paste the following code. Notice that the BaseMaterPage class inherits from System.Web.UI.MasterPage. This BaseMaterPage class will be used as the base class for the 2 master pages that we will be creating later. 3. Add a master page and name it Site.Master. Copy and paste the following html. 4. Copy and paste the following code in the code behind file. 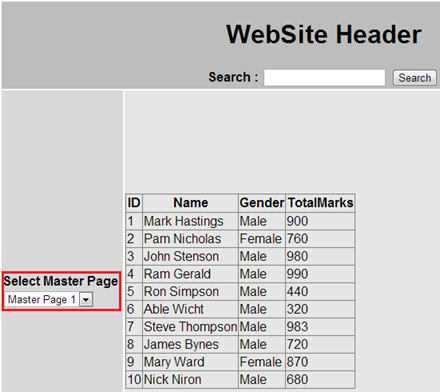 Notice that the Site master page class inherits from the BaseMaterPage class that we created in Step 1. 5. Add another master page and name it Site2.Master. Copy and paste the following html. 6. Copy and paste the following code in the code behind file. 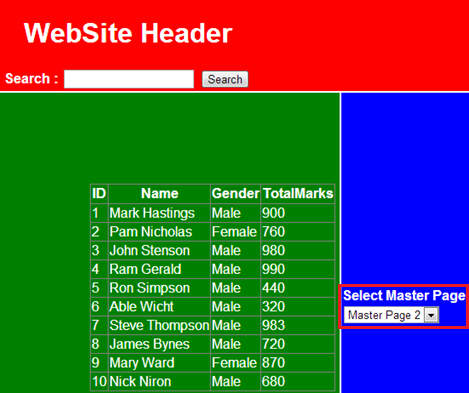 Notice that the Site2 master page class inherits from the BaseMaterPage class that we created in Step 1. 7. Add a class file and name it BasePage.cs. Copy and paste the following code. Notice that the BasePage class inherits from System.Web.UI.Page. This BasePage class will be used as the base class for all the content pages in our application. 8. 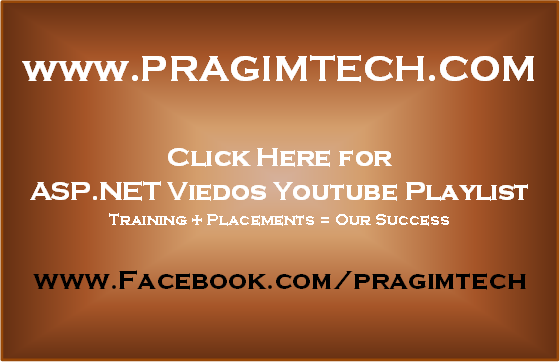 Right click on Site.Master page and select Add Content Page. Copy and paste the following html. Notice that we have set MasterType to BaseMaterPage class. 9. In the code-behind file of the content page, copy and paste the following code. If you need the sql script to create and populate table tblStudents, please refer to Part 149. The T-SQL for stored procedure spSearch is also available in Part 149.